Upcoming iOS 8 coming in fall, have a great features. One of them is send photo/video from iOS 8 to any apple devices are iPhone 4, iPhone 4s, iPhone 5, iPhone 5c, and iPhone 5s. iPad Mini (1st generation iPad mini), Retina iPad mini, iPad 2, iPad 3, iPad 4, iPad Air, iPod touch 5G. This sharing facility through the iOS 8 app makes picture/audio and video file sharing effortless. Here I will guide through, sent file from iPhone 6. You want to send file over another devices iPad, iPhone, so you have to go with same process given in below. Open message app, that comes with iOS 8. Click on a conversation or you can click on new message picture icon. Now tap the camera icon at left top corner of application. So press and hold it. During the holding this icon, you can send picture or record live video in your apple iPhone. To record video you must press continuously. From this step you will send photo/video from iOS 8. Send picture to selected recipient, you have to swap your figure toward to up. Here you have to move on yellow camera icon. 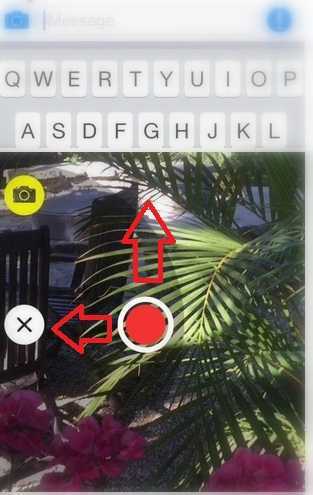 Send Video – To record video you have to swap toward right or you can also press record button (red button). For both, send photo/video you have to swap upward. To cancel this process in between you has to tax cross(x) mark in left side. To use above techniques, You don’t have to download any messaging app from iTunes. Useful: Top 5 best health fitness apps iOS 8: Healthy tips for health. Thanks to apple, giving wonderful stuff – How to drive photo/video from iOS 8, in sending multiple photos to multiple apple device in simple way. You have any difficulty in this easy stuff (How to drive photo/video from iOS 8), you can comment in below.